1) Download and install ImageJ. 2) Download the latest version of "OpenComet plugin" from the Downloads page and extract the zip file. 3) Browse for the extacted OpenComet_.jar and copy the file. 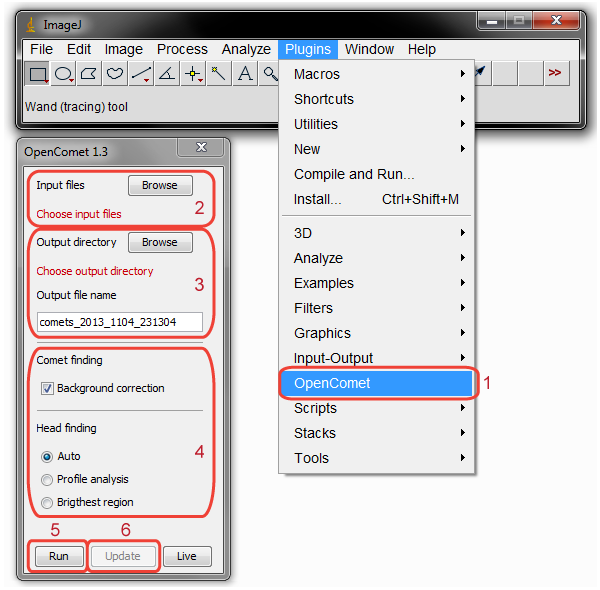 5) When ImageJ is launched, OpenComet will appear under the Plugins menu. OpenComet is released in several different packages, which can be obtained from the Downloads page. 4) Browse for the extracted OpenComet_.jar and click Open. 6) OpenComet will now appear in ImageJ under the Plugins menu. 1) Download the latest version of "OpenComet plugin ImageJ bundle" from the Downloads page and extract the zip file. 2) Launch ImageJ from the extracted folder. 3) OpenComet will appear in ImageJ under the Plugins menu. 1) Download and install Fiji. 5) When Fiji is launched, OpenComet will appear under the Plugins menu. 2) Download the latest version of "OpenComet plugin and source code" from the Downloads page and extract the zip file. 3) Launch Fiji and choose Plugins / Compile and Run. 4) Browse for the extracted OpenComet_.java and open. 5) The compiled OpenComet will now launch in Fiji. 1) Download and install Micro-Manager (Micro-Manager is by default bundled with ImageJ). 3) Browse for the extracted OpenComet_.jar and copy the file. 5) When Micro-Manager is launched, the ImageJ interface is simultaneously shown. OpenComet will appear in ImageJ under the Plugins menu. *You need to have write permission on the folder to be able to paste OpenComet_.jar. 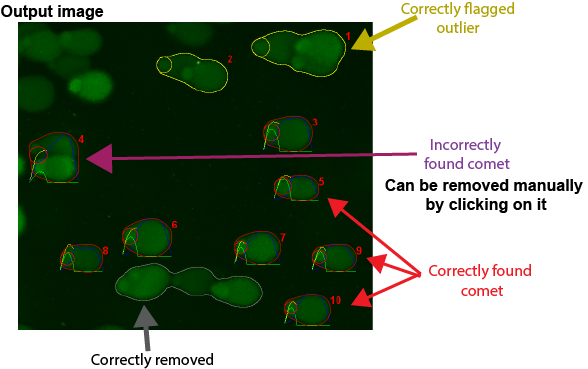 Use the following steps to analyze comet assay images using OpenComet. 1) Run OpenComet plugin – Launch ImageJ, and click on the Plugins menu. If OpenComet is properly installed, it will appear in the plugins list, and will run when clicked. 2) Select images to analyze – Click the Browse button next to the "Input files" label and choose any number of images from a single folder that you want to analyze. More information on choosing input images can be found here. 3) Select output directory – Click the Browse button next to the "Output directory" label and choose an output directory of your choice. Optionally, you can change the name of the output file by changing it under the "Output file name" label. Make sure you have permission to write in the chose output directory (otherwise OpenComet will not be able to save the output). More information on the output generated by OpenComet can be found here. 4) Set analysis options (optional) – In case you want to use the default analysis setting, you do not need to change analysis options. These settings influence the way OpenComet finds and segments comets. More information on the meaning and usage of analysis options can be found here. 5) Run – Click the Run button to perform the analysis for all the chosen input images. The final output images with marked comets and intensity profiles are shown in separate ImageJ windows. The output images, as well as the calculated statistics in a spreadsheet are saved in the output folder. More details about the output generated by OpenComet can be found here. 6) Review and update (optional) – After clicking Run, the output images resulting from the automated analysis are displayed. At this point, you can click on any comet in any of the displayed output images. The clicked comets will be classified as "deleted". After finishing the review process, press the Update button to overwrite the saved output images and create an updated output spreadsheet. More details on the review process can be found here. The input files for OpenComet analysis can be selected by clicking on Browse next to the "Input files" label. Any number of images stored in a single folder can be selected in the file selection window. Multiple files can be selected by holding Shift or Control on the keyboard while clicking on files. OpenComet accepts all common image formats such as TIF, BMP, JPEG, PNG and others. Normally, comet assay images will contain brightness information on a single channel in the image. If the image contains multiple color channels (such as R, G and B channels), OpenComet automatically selects the channel containing the brightness information. OpenComet requires that comets are oriented along the horizontal axis, the tails extending towards the right hand direction. It is also assumed that the comets appear as bright objects on a dark background. See example below. 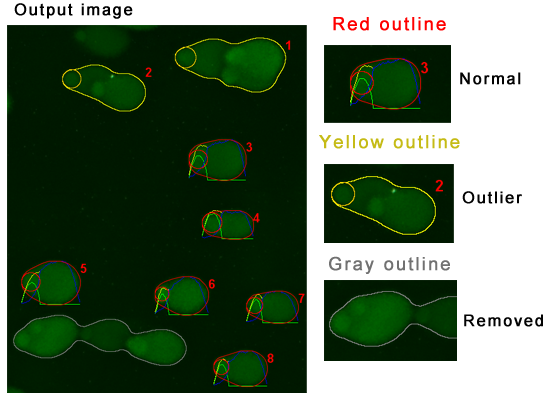 If the orientation of images differs from this, we recommend first rotating them in ImageJ or another image processing application, and then analyzing then using OpenComet. OpenComet is tested to perform well with various comet shapes and sizes including ones typical for neutral as well as alkaline comet assay. OpenComet works with a variety of magnifications, and has been tested for images captured between 5x to 40x magnification. Comet assay images often do not have uniform background illumination. Due to this, the background on one part of the image may be brighter than the comets on another part of the image. It is therefore recommended that if the illumination is non-uniform along the image, background correction is done in order to correctly identify comets in all parts of the image. If the Background correction checkbox is checked (default), OpenComet uses a rolling ball based background subtraction method to adjust the illumination along the image. This correction is done only for the purpose of finding comet shapes, and will not affect the calculation of measured parameters in any way. During the comet finding process, shapes in the foreground (bright shapes) are separated from the background. The shapes removed at this stage are marked with a gray outline in the output image, are not assigned an ID number and will not appear in any calculations or statistics. The following stage of filtering uses shape statistics based on the population of comets in the image to idenitfy comets that are potential outliers. The shapes flagged as outliers at this stage will appear a yellow outline in the output image, are assigned an ID number, are measured, and will also appear in all calculations and statistics. After having identified the comet shapes, OpenComet attempts to find the head of each comet. The Profile analysis option analyzes the brightness of the comet along the horizontal axis. By analyzing the shape of this profile, it finds a characteristic pattern corresponding to the border between the head and the tail. The Brightest region method first finds the set of brightest pixels inside the comet, and considers the center of these pixels as the center of the head. This method may fail if a cell is highly damaged, and the tail is very bright (sometimes brighter than the head). The Auto option (default) first applies the brightest region method to find the head, and if it detects that the method failed, it uses profile analysis to find the correct position of the head. The naming convention for the output is as follows. For instance, if the chose output folder is C:/CometOutput, and an input image is called comet1.tif, then the corresponding output image will be called C:/CometOutput/comet1_out.tif. The name of the output spreadsheet can be modified by setting the output file name. The default file name is based on the current date and time. The default setting would result in an output spreadsheet named C:/CometOutput/comets_2013_1104_231304.xls, which includes the year, month, day, hour, minute and second. Each comet analyzed by OpenComet has an identification number associated with it. The intensity profiles and outlines of all the comets and comet heads are shown as an overlay in each image the output images are both displayed and saved. The comets that are in clumps and at the edges are not considered for analysis. From the subset of valid comets, further comet validation steps will classify the comets as below and are represented with different outline. The various overlaid shapes are color coded, and can be interpreted as follows. An output spreadsheet generated by OpenComet contains several comet measures and their population statistics. In particular, DNA damage can be assessed through the DNA% in tail, Tail moment or Olive moment that are each one column in the output spreadsheet. One output spreadsheet is generated each time OpenComet is run, and each comet is identified by its input image name and comet number. If multiple images have been selected for analysis, the comet measurements for each of these images will appear in the single output spreadsheet. To facilitate the analysis process, the spreadsheet also contains population statistics about all measured comets. Statistics such as the mean, median, standard deviation, maximum and minimum values are calculated for all measurement parameters at the end of the file. A total of 19 columns (16 comet properties and 3 file and comet details) are in the output data file. The spreadsheet of the above-analyzed images is shown. Note that comets are flagged as normal, outlier or deleted. User can filter the data accordingly for further processing. At this point it is possble to manually remove any false positive (incorrectly recognized) comet from the output by simply clicking on it. The comet that has been clicked on will still retain its number ID, will still appear in the output spreadsheet flagged as "deleted", and its outline will be gray (instead of the original red or yellow) in the output image. It is important that to overwrite the original output, one must press the Update button. The Update button may be pressed any number of times during review, and the outputs will be updated at each press. When pressing Update, output images will simply be overwritten with the reviewed ones. However, for reference, the original output spreadsheet is retained, and a new, updated one is generated, whose name has the "_update" suffix. This video tutorial shows the steps of analyzing comet assay images using OpenComet v1.1.